This topic contains 0 replies, has 1 voice, and was last updated by Catherine Huitson 2 years, 3 months ago. As mentioned in Jørgensen et al. (2009), PASA, 26, 17, the GMOS-N shutter is a blade shutter, with the travel time for the shutter blades depending on the direction of movement. Jørgensen et al. give the magnitude of the effect as a ~1% uncertainty on an exposure time of 1 second. I wanted to share here an example of the effect of the unequal shutter travel times on timeseries data obtained with GMOS. 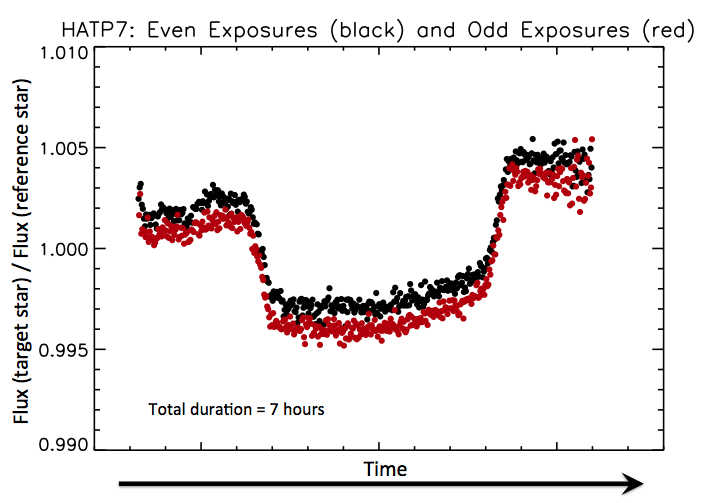 During one of our programs with GMOS-N, we performed a long series of 9-second exposures to observe an exoplanet transit. The total observation duration was ~7 hours. In the attached figure, I have plotted the differential flux between the target star and a similar magnitude reference star as a function of time. I have colored the even exposures in black and the odd exposures in red. The shutter reverses direction every-other exposure and it is clear to see that there are 2 sets of fluxes (black and red) which are offset in flux. What is interesting to note is that we still see an effect even though we are plotting the ratio of two stars’ fluxes per exposure. This occurs because the two stars that we are using are well-separated in the FOV (3 arcmin apart) and so the effect of the unequal shutter travel times is not the same in both stars. Our plan is just to treat the “odd” and the “even” timeseries as two different timeseries, normalized separately rather than to try to remove the effect. Has anyone seen any other examples of how this affects your data? If so, how did you handle it?